Cameta offers the best selection of cameras from the leading brands, including Canon, Nikon, Olympus, Pentax, Samsung, Sony and more! Your discount will be applied automatically at checkout on the Cameta Camera website. 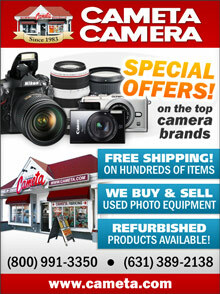 Digital Cameras - Since 1983, the experts at Cameta have been providing customers with quality cameras at great prices. Cameta is an authorized USA dealer for all major brands of photographic equipment, and features a wide variety of digitals from the top brands, including Canon, Nikon, Olympus, Pentax, Samsung, Sony and many more. Cameta also offers High Definition digital camcorders from brands you know and trust, so you can record your memories in full motion! With a huge selection of digital SLRs, point-and-shoot, waterproof and HD camcorders, Cameta carries the digital camera that is perfect for you! Lenses & Flashes - Enhance your best digital camera experience with a full range of accessories that will help you frame, focus and shoot like a pro. Find state-of-the-art digital SLR lenses, teleconverters and auxiliary lenses that will enhance every shot. Enjoy better lighting with external flashes that go above and beyond the capabilities of your built-in flash, with a wide selection of SLR flashes and flash accessories. Bags & Cases - Protect your gear with high-quality bags and cases that will precisely fit your equipment... and your style! Whether you need a hard case, holster, messenger bag, backpack, belt pack or sling, Cameta makes it simple to browse and buy bags with models conveniently sorted by type, case type, or brand. Easily find the bag that best suits your needs, with a wide assortment of sizes, colors and styles to choose from. Photo accessories - Find a large selection of quality photo accessories, including camera batteries, grips, memory cards, tripods, filters, remotes, lens hoods, flash diffusers, flash brackets, and much more! You'll find everything you need to help you capture amazing pictures and videos, and keep your camera in peak operating condition. In addition, there's underwater accessories, cleaning products, photo albums, printers, scanners, and dark room essentials. Refurbished & Used Equipment - Why pay more when you can point, shoot and save on an extensive assortment of direct-from-the-factory refurbished and Factory Demo models. Refurbished cameras, lenses and flashes are thoroughly inspected to arrive in mint or near-mint condition, and are covered by a full 1-Year Warranty. You can also browse a diverse collection of great used accessories, or sell your own equipment for cash or to upgrade your gear! For years, Cameta has served professional and amateur photographers alike, featuring the best digital cameras from all of the top brands, as well as a picture perfect collection of lenses, flashes and digital accessories that will meet the photographic needs of any pro, enthusiast or casual shutterbug.